In the sprints, he conserved energy through the heats and peaked in the Final, with a blistering start that saw him take the lead before the first buoy and maintain it through the duration of the course. Connor now returns to Maui still holding the yellow jersey, but in the knowledge that it is still all to play for this year on the Stand Up World Series, with Hamburg up next, and then the US Trilogy of events in Chicago, San Francisco and Huntington Beach. Zane Schweitzer (Starboard) from Maui comes back to form sensationally for this all important 4th stop on the Stand Up World Series, with a phenomenal performance in both the sprint and long distance racing. Zane is always know for his sprint racing skills, from fast starts to buoy turns and high revolution sprint techniques, something he once again showed finishing in 2nd behind friend and Starboard teammate, Connor Baxter. However, he really came into his own in the long distance race, finishing in 4th place amidst some of the very best athletes in the world and strengthening his position in the overall ratings as he moves up to 3rd place overall, behind Kai Lenny (Naish) and Connor Baxter (Starboard) – an incredible showing from the Maui crew. 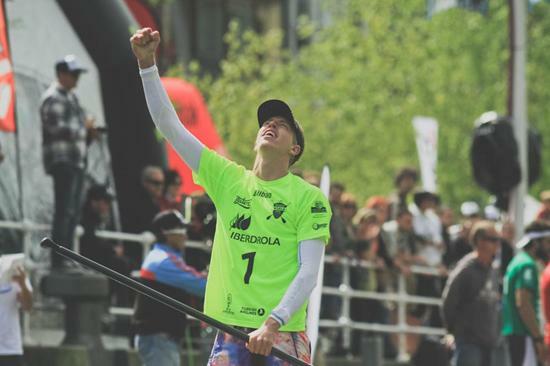 Gaeten Sene (Starboard) is most comfortable in river style racing, and once again showed here in Bilbao, that he is a master, finishing in 2nd place behind Connor Baxter (Starboard) in the long distance, piecing together an impressive race. Meanwhile, in the sprints, his starts were on point and his sprint techniques got him the result he was looking for, finishing in an impressive 5th place, landing him in 3rd overall for the event. 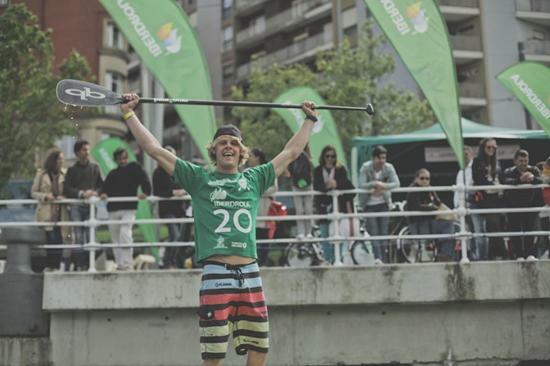 Casper Steinfath (Naish), the ever impressive ‘Viking’ put on another stellar performance this weekend at the Bilbao World SUP Challenge, finishing in 5th in the long distance yesterday and then storming to an impressive 3rd place finish in the sprints today, propelling him into 4th place overall for this all important 4th Stop on the 2013 Stand Up World Series. 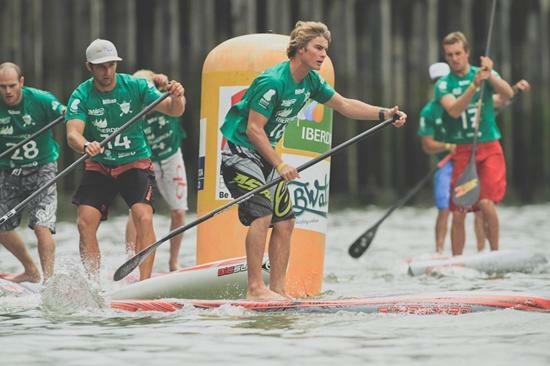 Casper also has his eyes on the European Trilogy Title, that will be the overall result from the 3 events in Europe this year, and with one event to go in Hamburg, he is currently lying in 2nd behind Maui’s Connor Baxter (Starboard). One thing is for sure, Casper is a major force on the World Series and continues to go from strength to strength this year: you can be sure you will be seeing a great deal more of him in 2013! 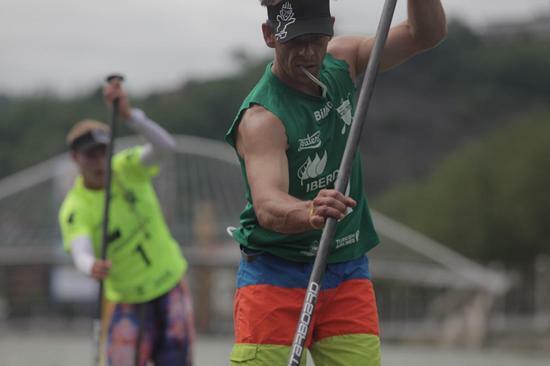 Eric Terrien (Bic SUP) put on a solid performance in the long distance, hammering his way around the course to finish in 3rd place. 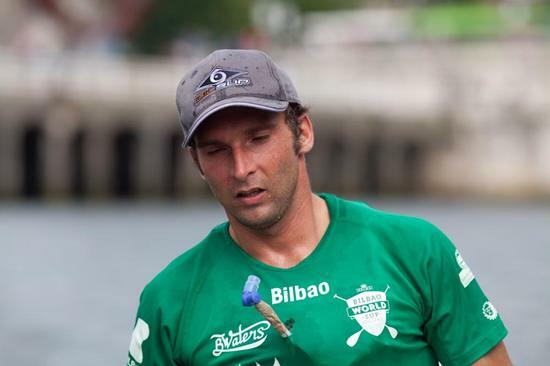 He then went onto make the final of the sprint racing, finishing in 7th place, forcing a tie break with the on form Spanish athlete, Roman Frejo (Starboard). After a 6th in the long distance, Roman finished in 4th in the sprint racing, causing a points tie. As the two dynamic athletes took to the course, you could see the grit and determination in Eric’s eyes, as he powered over the finish line to take the win, and as a result, 5th place overall for the event, with Roman having to settle for 6th. All in all, a great performance by both talented and determined athletes and great to have such a strong representation for Spain in the form of Roman Frejo. 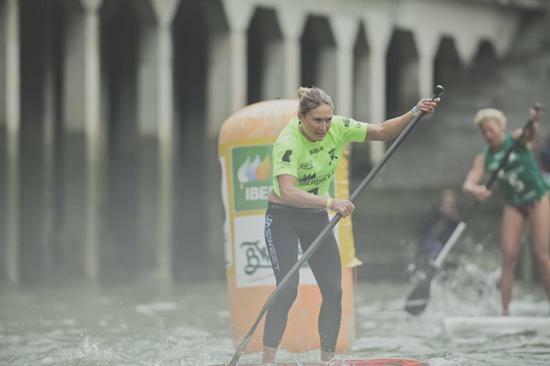 Annabel Anderson (Starboard) from New Zealand once again put on a blistering performance this weekend at the Bilbao World SUP Challenge, taking bullet wins in both the Long Distance and Sprint races. Annabel’s level of performance, drive and sheer competitiveness continues to astound, as she once again finished in the Top 10 in the men’s division for the long distance and convincingly took the honors in the Sprint Racing. 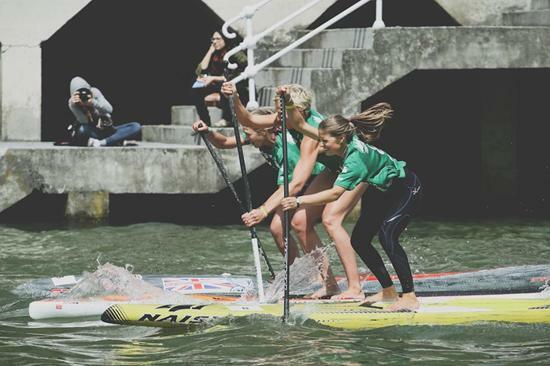 Despite some major competition from the likes of Sonja Honscheid from Germany, Laura Quetglas and Manca Notar (Naish) to mention just a few, Annabel stood strong and maintained her unblemished record on the Stand Up World Series and the ratings lead. A major congratulations goes out to this incredible athlete. Sonja Honscheid provided a great battle for Annabel Anderson (Starboard), finishing in 2nd place in the long distance and then in 2 out of 3 of the Sprint Racing Finals, earning her a worthy 2nd place overall for the event. 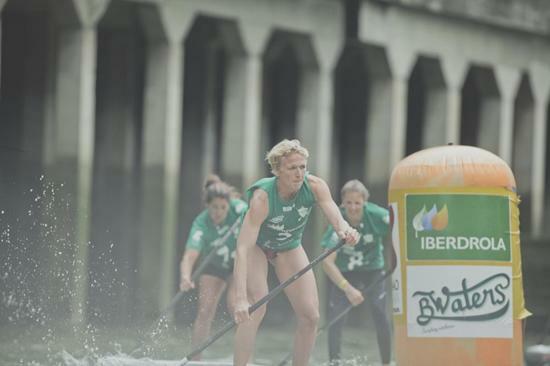 As one of Europe’s leading women athletes, she is a name to watch out for, especially as we head to her country in August for the Hamburg World Cup of SUP, stop 5 on the Stand Up World Series and the final stop on the European Trilogy of events. From the overall 3rd place finisher Laura Quetglas from Spain and the UK’s Marie Buchanan (Starboard), to Manca Notar (Naish), the young Eastern European talent who was so ill she was unable to compete in the long distance on day 1 but paddled valiantly in the sprints, the performance level in the women’s fleet has gone through the roof and it is exciting to see. As we now build up to stop number 3 of the European Trilogy and Stop number 5 in the Series to take place from 16th – 18th August in Hamburg Germany, the athletes now have a chance to re-group, train and prepare mentally for the next exciting stop on the Stand Up World Series. Annabel Anderson (Starboard) may be out in front for now, but the year is far from over as the US leg will kick off on the 23rd August in Chicago…. With the caliber of competition in Bilbao for this 4th stop on the 2013 Stand Up World Series, the action, rivalry and serious competition was assured. However, the City of Bilbao stepped up to provide a phenomenal platform for the world’s best, from race courses that promoted the highest level of competition, to an unmatched welcome, experience and backdrop. 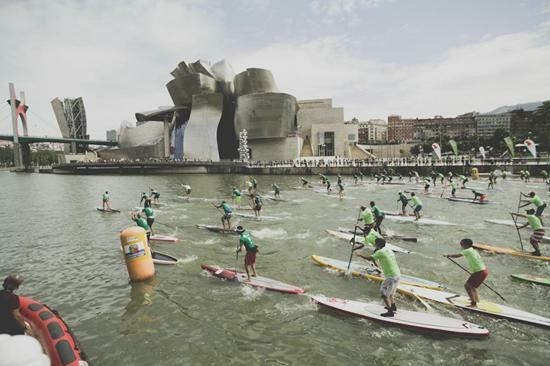 The City of Bilbao has put themselves on the map through this epic World Series event, as we look forward to coming back in 2014 for an even bigger and better edition. A big thank you goes out to the City, BWaters and all our sponsors, as well as of course, the Stand Up World Series Patrons who continue to support the growth and development of this incredible sport of Stand Up Paddling and its professional sporting Series.